California STDs Raging At All Time Highs For Third Year In A Row : The Two-Way In addition to the record rise in cases of sexually transmitted diseases, the state has seen a spike in the number of stillbirths caused by syphilis. 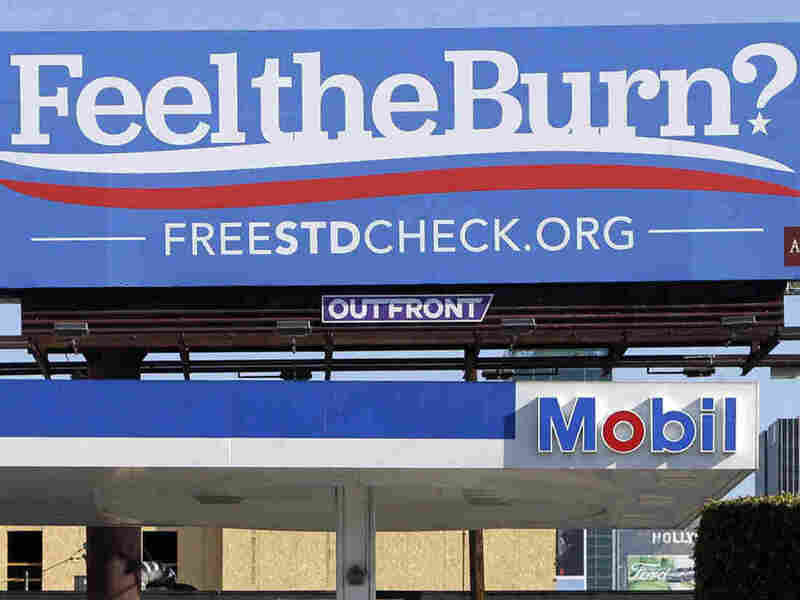 A billboard above a gas station reads "Feel The Burn," a play on 2016 presidential candidate Bernie Sanders' campaign slogan, "Feel The Bern." It's actually promoting tests for sexually transmitted diseases. But what is "particularly concerning" to the department is that the number of stillbirths due to congenital syphilis increased to 30 — the highest number reported since 1995. And the overall cases of California babies born with the disease — passed through the placenta from their mothers — has more than quadrupled since 2013 to 278 last year. It can cause severe neurological problems, deformities or blindness, among other serious ailments. Chlamydia is by far the most widespread of the three diseases, especially among young women under 30. Men account for the majority of syphilis and gonorrhea cases. If left untreated, the health department noted, chlamydia and gonorrhea can cause pelvic inflammatory disease and can lead to infertility, ectopic pregnancy and chronic pelvic pain. "STDs are preventable by consistently using condoms, and many STDs can be cured with antibiotics," CDPH Director and State Public Health Officer Dr. Karen Smith said in a statement. "Regular testing and treatment are very important for people who are sexually active, even for people who have no symptoms. Most people infected with an STD do not know it." Dr. Heidi Bauer, chief of the state health department's STD Control Branch told NPR the rise in STDs can be blamed on a multitude of factors that vary by demographic. For instance, the rise in gonorrhea and syphilis among gay and bisexual men can be partially due to the efficacy of HIV/AIDS treatments. "Because of that there is less concern about the transmission of HIV and using condoms," she said. Rural populations have suffered greatly from the closure of smaller health clinics, closed as a result of statewide budget cuts during the recession. Bauer said, people with limited access to care "have had to scramble," traveling long distances to receive medical attention or testing. And in some, not every provider stocks the medications to treat STD cases, she said. The ubiquity of "hookup" apps is another contributing factor. "The internet and smart phones have made it very, very easy to create social and sexual connections between people," Bauer said, adding that short-lived relationships, during which many people don't bother to exchange meaningful contact information, makes it challenging to notify previous sexual partners of dangerous infections. The data out of California are consistent with the most recent nationwide numbers available from the Centers for Disease Control and Prevention, which logged more sexually transmitted diseases than ever in 2016. More than two million cases of chlamydia, gonorrhea and syphilis were diagnosed in the United States that year and early reports indicate 2017 may be another record setting year. Alaska, Louisiana and Mississippi had the most chlamydia cases per capita, while Mississippi, Louisiana, and Georgia ranked highest for gonorrhea. The District of Columbia, Louisiana and New York scored ignominious recognition for cases of syphilis. In California, the health department is collaborating with the state department of education and community groups to ensure schools provide comprehensive STD/HIV prevention education, as is required by the 2016 California Healthy Youth Act.